Read: "Turiya Sings: Inside Alice Coltrane’s Sai Anantam Ashram"
Just around Sunset on Sunday, 12 November, the spiritual Sai Anantam Ashram Singers will gather in TivoliVredenburg's Grote Zaal. 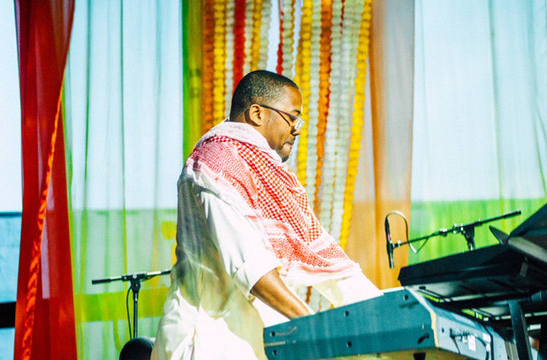 Over the years, they have been bringing chants as followers of the legendary Alice Coltrane Turiyasangitananda. Now, Red Bull Music Academy have published an interview with Surya Botofasina, explaining more about the Sai Anantam Ashram singers. It's an inspirational story about spiritual Sundays, impromptu piano lessons and eye-opening trips to India. "I consider it sacred music. The devotional songs called “versions” have been sung for over three decades straight in the ashram that she founded, that I grew up on along with the rest of the kids and families who lived there. To be a part of taking that tradition and now trying to do our part to uphold it in a new medium, at a crucial time, has been an absolute blessing. It has been a labor of love and frankly a huge joy." The Sai Anatam Ashram Singers perform the Ecstatic Music of Alice Coltrane at Le Guess Who? 2017 on Sunday, 12 November. Matana Roberts, Mary Margaret O'Hara, Linton Kwesi Jonhson, Linda Sharrock, Alanis Obomsawin, and more perform that day as well.